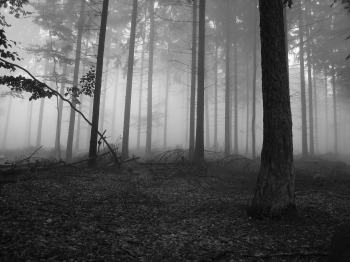 This forest with its wispy gray mist is so pretty, you may not have even noticed that the photograph itself is not in color. And it breaks her heart"
—Dave Matthews Band, "Grey Street"
Gray or "grey" is the one commonly-recognized color that is most desaturated — in its plainest form, it doesn't go anywhere on a color wheel. It stands in the middle. Gray can thus personify boredom, depression or emotional numbness. However, gray is also associated with fairness and neutrality, never giving you too much or too little. In moral symbolism, gray also represents moral complexity, where nothing is quite clearly good or bad, but shades of both. Gray can also be a beautiful color in its own right, especially celebrated as the color of silver, and the hue of mist. Technically, black and white are both shades of gray, but they are more commonly considered colors in their own right. The color most commonly associated as gray includes most of the shades lighter than black and darker than white. See also Shades of Conflict.